Mama Chick is made from Create-a-Critter 2 cartridge (Mom Chic) and is cut at 4 ½ inches. Cut accessories and layers at same size so they will be proportionate to the chick. 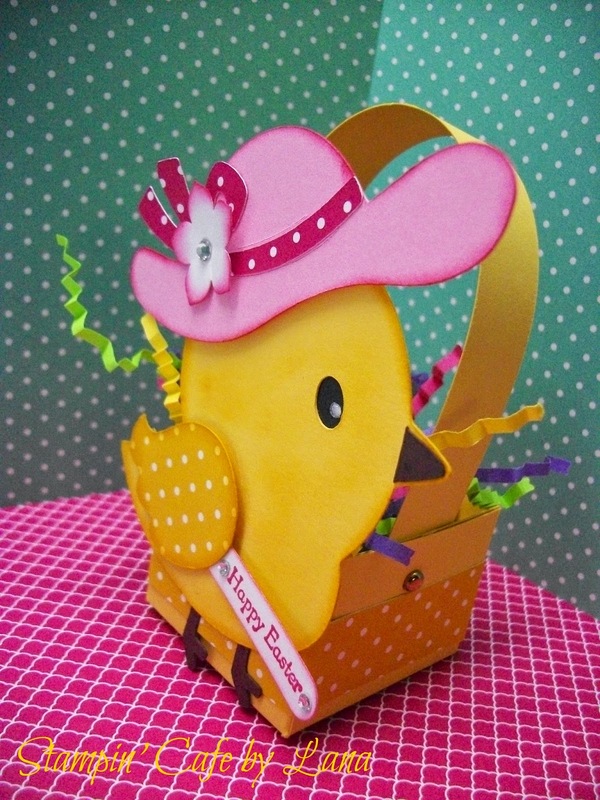 I added a punched flower to the hat with a rhinestone and added the “Happy Easter” tag below the wing. All supplies for box and chick are from Stampin’ Up! Box is cut from a 5x5 inch piece of yellow cardstock, scored at 1 ½ inches on all 4 sides. Cut up to score line on 2 opposite sides of square, trim where necessary and adhere together. Handle is made from a 6 x ½ inch piece of matching cardstock and attached to 2 sides of box with small brads. I also added a ½ inch trim piece to the box. This was cut at ½ x 8 ½ inches to allow for a small overlap. Attach chick to front of box and add colorful Easter grass. Finished size of basket is 2 x 4 ½ inches. 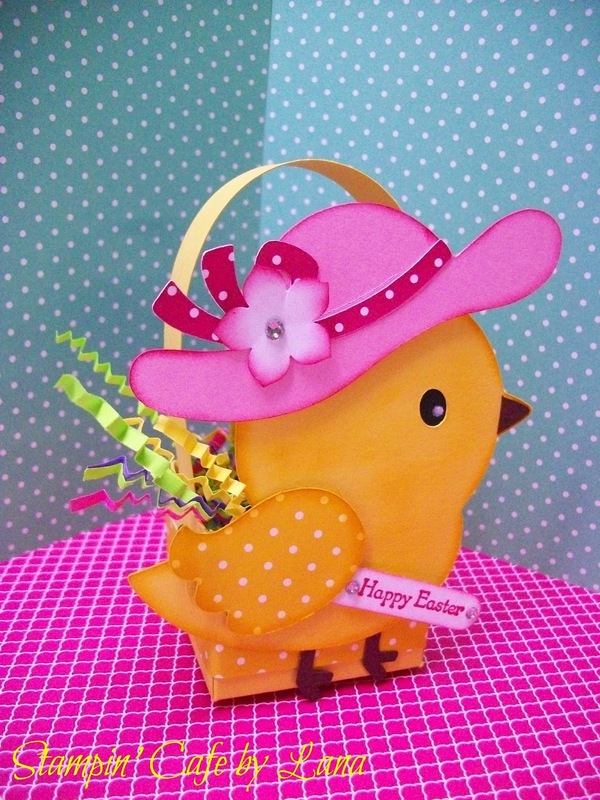 Would make great favors for your Easter table or cute little baskets for school or Sunday school. I’m thinking of making them in different colors, like Peeps. I think that would be really cute. Hope you enjoy! Thank you Nancy. Glad you stopped by! You are very welcome. Let me know how your grandkids like them! I got your comment. Sorry you had trouble but glad your baskets turned out and that your grandkids liked them. My 2 year old granddaughter liked the chic too. Hope you had a nice Easter!